Mold and bacteria can severely impact the quality of meat, chicken, fish, fruits & vegetables that may be stored or prepared in warehouses and cold rooms. Ethylene off-gassing causes fruits and vegetables to prematurely ripen & age, dramatically shortening shelf-life. Sanuvox UV CoilCean IL systems are installed facing the cooling coil are designed to bask the coil and air with ultraviolet energy destroying microorganisms including bacteria, mold and viruses while oxidizing & reducing ethylene off-gassing. OBJECTIVE: Destroy airborne bio-chemical contaminants such as bacteria, viruses & mold that may affect the storage and preparation of fish, chicken and meat. Destroy ethylene off-gassing which causes produce to ripen faster extending shelf-life. EQUIPMENT: IL MULTISPLIT units installed facing the cooling coils in the fan coil unit. 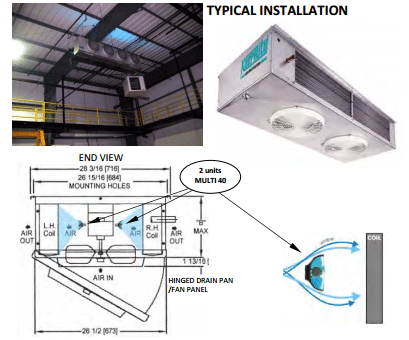 Each IL unit includes a UVC/UVV lamp mounted in an anodized aluminum parabolic reflector. The ballast box incorporates LED status lights for providing lamp status & replacement (2 yrs.) and can be remotely monitored. Produce will degrade due to the rotting process. Rotting is caused by parasitic fungi and mold. Food deterioration begins with the breakdown of the cellular tissue by enzymatic action that allows the growth of microbes. Germicidal UV (UVC) is extremely effective at preventing the reproduction of bio-contaminants. UVC destroys airborne fungi, molds and their spores, limiting the contamination spread from one fruit to another. Meat, fish & chicken are especially vulnerable to airborne biocontamination. UVC sterilizes the air destroying contaminants as they circulate within the cold room. Photo-oxidation with UVV can be used to reduce chemicals that trigger the ripening of fruits and vegetables. The life stages of a plant are influenced by plant hormones. An organic compound involved with ripening is ethylene, a gas created by plants from the amino acid, methionine. Pectinase, which hydrolyzes pectin, a substance that keeps fruit hard. UVV oxidizes and thus neutralizes the ethylene molecules released by the ripening process, slowing down the spread of ripening to the surrounding produce. This oxidation process breaks down ethylene into carbon dioxide and water vapor.